Austria's second largest city, Graz lies on the River Mur and has long been a popular stopover for tourists. Highlights include exploring its many historical buildings, particularly in the Old Town with its numerous Baroque façades. Another big draw is the Schlossberg, a large hill that rises behind the picturesque town. While excavations reveal the area was settled as far back as AD 800, the town was first mentioned in 1128, after which time it passed into the hands of the Habsburgs and soon after rose in importance as a place of trade and commerce. Many of the surviving buildings were influenced by Italian architectural styles, including Schloss Eggenberg. As a result of this abundance of historically significant buildings, Graz is today an important cultural center that was added to the list of UNESCO World Heritage Sites in 1999. Graz is the birthplace of Hollywood star Arnold Schwarzenegger, and a little museum here is dedicated to his career. 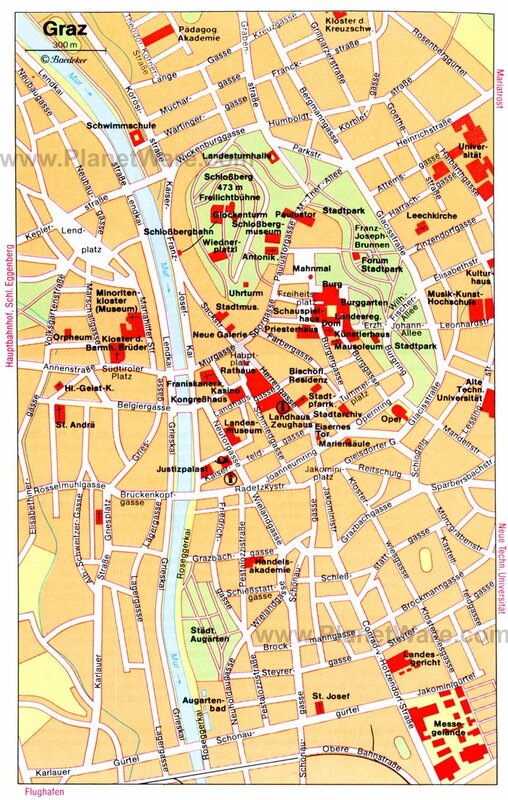 The UNESCO-acclaimed Old Town center of Graz is filled with historical architecture, and is a pleasure to explore on foot. Highlights include the Hauptplatz, the Main Square, on the left bank of the River Mur, with its fine statue of Archduke Johann (1782-1859), who did much to bring industry to the region and improve communications and trade. Also of note are the Town Hall (Rathaus), built in 1893, and the 17th-century Haus am Luegg, with its attractive arcaded and stucco-decorated facade. To the west of the Main Square is the Gothic Franciscan Church (Franziskanerkirche), notable for its west tower from 1643 and its Late Gothic nave with a ribbed, vaulted ceiling. The church's Chapel of St. Anthony, separated from the main building by a Baroque grille from 1650, is worth seeing for its pietà from 1720. Other Old Town attractions include the Graz Municipal Museum (Stadtmuseum Graz); the Mohren Apotheke's Theriak Museum, dedicated to old pharmaceutical practices; and the Robert Stolz Museum, honoring the famed Austrian composer born here in 1880. Finally, be sure to stroll along the Herrengasse pedestrian precinct with its many handsome old mansions, including the lovely Painted House (Gemaltes Haus) with its frescos from 1742. Above Old Town Graz rises the Schlossberg, a 473-meter-tall hill that can be ascended by funicular railway (it takes just three minutes to get to the top) or, alternatively, via a pleasant 20-minute walk. Highlights include the superb 28-meter-tall Clock Tower (Uhrturm), the city's best-known landmark. Built in 1561, it's all that's left of the massive fortifications that once stood here and which were dismantled after the Treaty of Vienna in 1809. Several other attractions are here as well, including the 94-meter-deep Turkish Well (Türkenbrunnen) and the 35-meter-tall Belfry (Glockenturm) from 1588 with its eight ton bell (affectionately known as Liesl). The café offers superb views over Graz; there's an open-air theater, and kids love the miniature railroad. On Graz's Herrengasse, the Styrian Armoury (Landeszeughaus) has been home to the provincial arsenal since 1644. The worlds' biggest historical armory, its permanent collections include 13,400 small arms and accessories, of which 4,259 are pistols. The artillery collection contains volley guns, mortars, cannons, falconets, and their accessories, and there are more than 2,000 edged weapons - swords, broadswords, and sabers. Most impressive is the display of armor, showing how soldiers of all ranks protected themselves from the weapons of their time. These range from shields, armored sleeves, and chain mail to full suits of armor. Among the 3,844 items is a horse armour made around 1510 in Innsbruck. The collections are dramatically displayed in traditional armory style, without signs or placards that would ruin the historic appearance of the setting. Pick up a free visitor's guide in English at the entrance or rent the inexpensive audio guide for descriptions and background on the exhibits. In the heart of Graz's pedestrian-friendly Old Town stands the majestic Landhaus, home to the Styrian provincial government. Built in Renaissance style in 1565, it's widely regarded as one of the finest such buildings in Austria. Passing through the splendid main façade, dominated by rounded windows and a loggia, you'll end up in the superb arcaded courtyard with its three-storied pergolas on two sides and a beautiful Renaissance fountain (if possible, try to time your visit to coincide with one of the regular outdoor concerts or theatrical performances held here). Interior highlights include the sumptuous Knights' Hall with its exquisite stucco ceiling from 1746. Another government building to visit is Graz Burg, an old palace famous for its 15th-century double spiral staircases (the Staircase of Reconciliation), which meet on each floor, creating a bizarre optical illusion. Looking a little like some alien life form plunked in the middle of Graz's splendid old architecture, the ultra-modern Graz Art Museum (Kunsthaus Graz) was built in 2003 to mark the city's choice as the European City of Culture. Focusing on works of contemporary art of the mid-20th Century, the gallery hosts artists from around the world with regularly changing temporary exhibits. The best views of the building are available at night, when the building lights up like a spaceship. English language guided tours and audio-guides are available. Another Graz landmark built to commemorate the city being granted the role of European Capital of Culture in 2003 is a man-made island known as the Murinsel. Made entirely of steel and resembling a large upside-down seashell, it's really a 47-meter-long floating island in the middle of the River Mur that's tethered to its banks by two footbridges. The middle section consists of a unique amphitheater used for concerts and other events, as well as a café and a children's playground with a rope maze and slide. 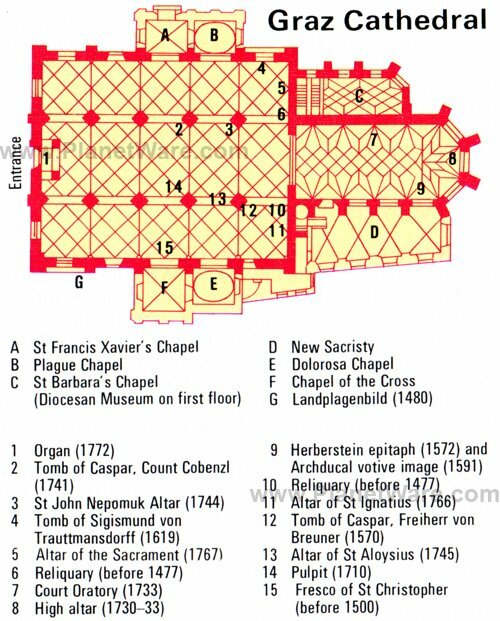 Graz's Late Gothic St. Gile's Cathedral (Grazer Dom) was built between 1438-62 on the site of an earlier church dedicated to St. Giles, which was first referred to in 1174. Of particular note is the main doorway decorated with the coat of arms of its builder, Emperor Frederick III, and on the south external wall, facing onto a small square, are the remains of a Late Gothic fresco from 1485 called the Landplagenbild, depicting Graz threatened by pestilence, the Turks, and a plague of locusts. The mainly Baroque interior is equally impressive, its wide nave separated from the choir by a narrow triumphal arch flanked by two fine reliquaries from 1477. The choir, dominated by a high altar, is notable for its altarpiece portraying the Miracle of St. Giles, while in the aisles are many fine monuments and altars. Be sure to also visit the Adjoining Mausoleum, built in the early 1600s for Emperor Ferdinand II and noted for its Tomb Chapel with exquisite artwork and sculptures. The Baroque Mariatrost Basilica sits at the top of a hill, ascended by more than 200 steps that pilgrims climb, reading the messages as they go. The interior of the popular pilgrimage church is Baroque, although the Madonna on the high altar is late Gothic in origin. Highlights are the 1779 pulpit by Veit Königer, the inlaid side altars, and the frescoes. There are sweeping views from the basilica, and it's a favorite place to watch the sunset. To reach it from central Graz, take Tram 1, marked Mariatrost, to the final stop. Endowed by Archduke Johann in 1811, the Natural History Museum - part of the larger Universalmuseum Joanneum group of city-owned cultural institutions - is one of the most important museums in Graz. Spread over several floors, its large collections include many artifacts, specimens, and displays relating to geology, zoology, and botany. You'll also learn about the history of the region since the time of the earth's formation thanks to its fascinating displays of fossils and exhibits on Ice Age creatures and ancient volcanoes. The Graz Stadtpark, at the eastern end of the Opernring with its modern Opera House, was laid out in 1869 on the site of the city's old fortifications. A highlight of this large municipal park is the Emperor Francis Joseph Fountain surrounded by numerous figures and monuments, including many famous Austrian writers, scientists, and politicians. The city's other important park is its Botanical Gardens, tucked away in the city's poshest residential area. Noted for its ultra-modern greenhouse with exotic flora from around the world, the garden's displays are broken down into four main climatic zones - tropical, Mediterranean, temperate, and alpine - each accessible over a series of fun wooden gangways and bridges. Luxury Hotels: On the river, close to the funicular and a short walk to Hauptplatz and Old Town attractions, Schlossberg Hotel has a pool, covered parking, and spacious rooms furnished with a blend of antiques and contemporary art. At the bridge across the river from the Old Town, Hotel Das Weitzer includes breakfast and a good Wi-Fi connection. Older budget rooms are in an annex. With a pool, sauna, free breakfast, and free parking, a 10-minute walk from the Old Town, Parkhotel Graz is in a quiet neighborhood with restaurants. Mid-Range Hotels: Across the river, a 10-minute walk from the Old Town, Mercure Graz City has functional rooms and nearby underground parking. A longer walk from attractions, but with a swimming pool, sauna, and fitness area open 24 hours, Augarten Art Hotel is filled with the owner's private art collection. Room access is from an outside corridor. In the Old Town near the cathedral, Hotel Zum Dom rings of old-world elegance, with large rooms and free Wi-Fi. Budget Hotels: A 20-minute walk from the old center and on a bus stop, The Star Inn Hotel Graz has underground parking and large rooms with balconies, more luxurious than their price suggests. With small serviceable rooms and secure parking, across the river from the Schlossberg and an easy walk to the center, Ibis Budget Graz City is also handy to shops and restaurants. Hotel Mariahilf is just across the river from the Old Town, near the art museum. Considered one of Europe's top open-air museums and Austria's largest, this huge facility preserves 98 historical farm buildings from all the country's regions, showing their construction and how people lived and worked in them throughout history. This immersion into six centuries of rural Austria also preserves folk skills, crafts, and traditions. The 76 original historical buildings were carefully dismantled in their original locations and reconstructed here, while the remaining are exact replicas of originals that could not be moved. Along with homes and barns, the collection included a dovecot, ropewalk, oil press, corn mill, blacksmith shop and forge, wine press, winemaker's cottage, windmill, and several styles of mountain huts from various alpine regions. You can sample typical local foods at the Gasthaus Zum Göller. One of the prettiest areas in the Styrian region lies around Voitsberg. For beautiful views of the area, climb to the ruins of Castle Krems (Burgruine Krems), where you'll also find exhibits of modern art and gardens. More romantic in their ruin and overgrown with forest are the stone walls of nearby Neuleonrod castle. Stop also to see the intricate paintings on the façade of the chapel in the village of Tregist, also near Voitsberg. Voitsberg is the home of the famous Lipizzaner horses of the Spanish Riding School in Vienna, the oldest thoroughbred horse breed in Europe. They are bred at the Piber Lipizzaner Stud Farm in the village of Piber, about an hour from Graz. A Baroque palace serves as the visitor's center, and you can see the white Lipizzaners with their black foals in the corrals. Look around on your own or join a guided tour that includes the stables, farrier's shop, and a museum. There's a playground and adventure trail for children, and you can reserve rides in a carriage pulled by a team of Lipizzaners.